I do like lamb meat, and that includes lamb mince. 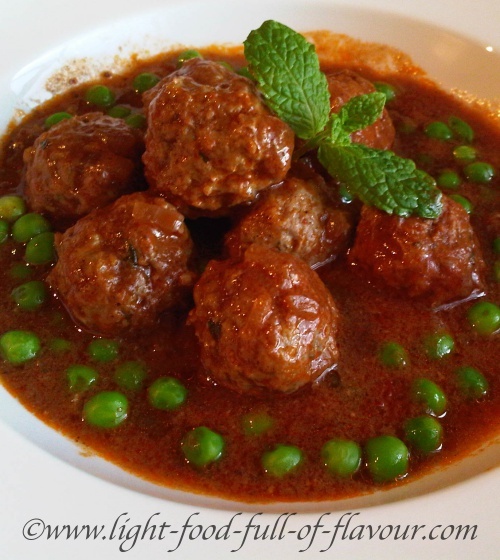 These Moroccan lamb meatballs are simply divine, as is the sauce you cook them in. I also add sweet green peas to the sauce towards the end. I love this dish! I do use quite a few different spices in this recipe, but these spices are good to have at home if you are a fan of Middle-Eastern food – as well as Asian-style food. I serve this dish with LOTS of oven-roasted carrots and steamed broccoli and green beans – making it into a healthy and easy-digestible meal. You can add quinoa or couscous to the meal as well – protein-rich and super-nutritious quinoa being the best choice. Following “food combining” rules as much as possible means not eating concentrated protein foods (meat, poultry, fish, whole eggs) together with concentrated starch foods (potatoes, wheat, rice, oats, pasta and bread). Both of these food groups go well together with vegetables though (apart from potatoes) – including beans, lentils and chickpeas. The reason behind food combining is that concentrated protein and concentrated starch are digested totally different. So to be able to digest all of what you eat in the best possible way and thus get the as much nutrients out of your food as possible, you are better off not eating these two food groups together. 1. Start by making the sauce. Place the oil in a spacious pan or pot that has a lid over a medium high heat. Add the chopped onion and cook - stirring frequently - for about 5 minutes, until the onion has softened. 2. Add all of the spices and continue to stir and cook for a further minute before adding the stock and tomato puree/paste. Stir and bring to a simmer. Season with some salt and pepper and leave the sauce to simmer and thicken for about 15minutes. 3. While the sauce is cooking, make the meatballs. Mix together the grated onion, crushed garlic, chopped mint, egg, cumin, salt and pepper in a bowl. Add the mince to the bowl and mix everything together thoroughly. With your hands, form the mixture into little balls – slightly smaller than a walnut. 4. Check the seasoning of the sauce before adding the meatballs. Bring back the sauce to a simmer and keep rolling the balls around so that they cook evenly, for about 15 minutes. Add the frozen peas to the pan/pot, stir, cover with the lid and increase the heat. As soon as it comes back to a boil, turn off the heat. Leave for a couple of minutes before serving.